Will I earn Continuing Education Credits for courses? How can I tell which courses are best for me and my staff? How do I purchase an on-line training course? Can I purchase a course for multiple staff members? Are group discounts available for on-line courses? Where are the group discounts listed? I have a code that is supposed to give me a discount. How do I use it? We have purchased on-line courses for our facility in the past. How do I add a new course so that it is available to our facility learners? How do I view or change my account information? Where do I view previous invoices? How can I get help with purchasing a course? Can I request a refund? What if I see someone else's name on the computer as logged in? How do I see my list of available on-line courses after I have purchased them? I have purchased courses for multiple staff members. How do my staff access training courses I have purchased for them? What are the computer requirements for the on-line courses? How long will I have access to the on-line courses? Many of my staff are not computer users. How will they know what to do? How do I start an on-line course? Am I supposed to hear audio? What if I don't hear anything? My course opens OK, but the screen is cut off at the bottom. How can I correct this? What if I need to leave the course and come back to finish later? Will I lose my place? Will I be tested on the content? How do I access the posttest? What if I don’t pass the test? Can I retake it? How do I exit the training course? How do facility managers track the course progress of their staff? I have a code (promotion or gift certificate) that is supposed to give me a discount. How do I use it? What if I see someone else’s name on the computer as logged in? I purchased a course for multiple staff members. How do my staff access training course I purchased for them? Right click with your mouse. This should pop up a menu that has a “Properties” option near the bottom. Move your mouse over the “Properties” option and then click on it with your left mouse button. Next, look at the section near the bottom left that says “Screen resolution”. Likely yours is set to 800x600 or something lower. Try grabbing the little pointer / slider and slide it to the right until it says “1024 by 768 pixels”, and then click the OK button. This should change your screen resolution so the training is properly displayed. 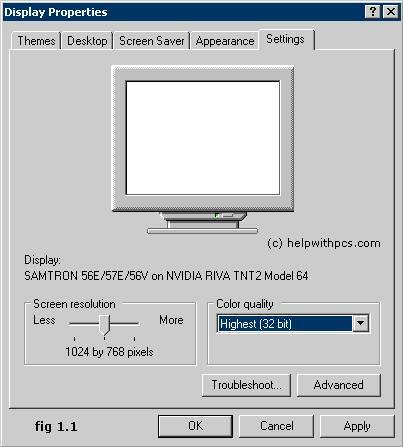 Windows Vista has a slightly different way of changing the screen resolution. Right click with your mouse. This should pop up a menu that has a “Personalize” option near the bottom. Move your mouse over the “Personalize” option and then click on it with your left mouse button. This should bring up a screen with several different personalization options. Near the bottom you should see “Display Settings”. Click on the Display Settings option. Under the “Resolution:” section near the bottom left, grab the slider and move it to the right (suggest 1024 by 768 pixels) and then click “OK”. 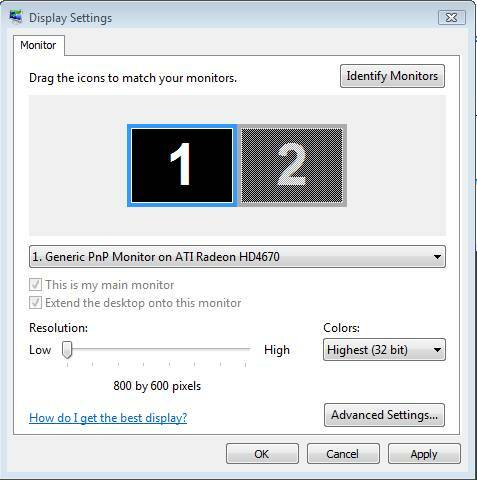 This should change your screen resolution so the training is properly displayed.